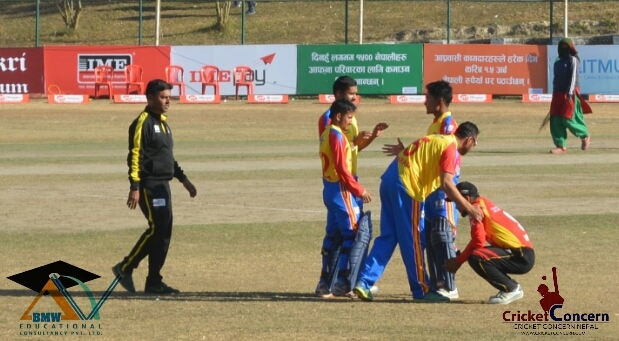 Bhairahawa Gladiators sealed a victory against Lalitpur Patriots by 3 wickets in a thriller. Winning the toss, Gladiators asked Patriots to bat first. Patriots got the good start but Gladiators succeed to pull back and managed to restrict Patriots on the total of 132 runs. Patriots opener duo, Jaykishan Kolsawala and Shankar Rana shared 51 runs partnership for the first wicket in 55 balls before Puneet Mehera sent back Kolsawala in his personal score of 42 runs off 37 balls which included five fours and two sixes. Sunny Patel scored 24 runs off 18 balls with the help of two sixes and a four. And late blistering cameo of 22 runs off 9 balls with two sixes and fours respectively from Dipesh Bhandari helped Patriots to propelled their total to 132 runs with the lost of 6 wickets in respective 20 overs . For Gladiators, Puneet Mehera struck two wickets where Aarif Sheikh, Hari Shankar and Bhuwan Karki also picked up a wicket each. In reply, Gladiators started off decently with 25 runs partnership for first wicket. Salunke provided them a blistering start with his 32 runs off 22 balls which includes 3 fours and sixes respectively. It seemed hard for Gladiators once when they needs 13 runs off last over but back to back sixes followed by single by Rohit Paudel sealed a match for them. He scored 28 runs from 17 balls with a four and two sixes. For Patriots, Pawan Sarraf and Lalit Rajbanshi picked up two wickets each. Lalit Rajbhanshi bowled a dream spell of 4 overs 1 maiden and 2 wickets with just expensing 9 runs. Nepalese spin sensational Sandeep Lamichhane expenses run at an economy of 16.50 and concede 33 runs in his 2 over’s and picked up a wicket of Salunke. Bhairahawa Gladiators will meet Biratnagar Warriors in the final of TVS EPL 2017 on Saturday. WCCL 2015-17: Pictures Collection Of Nepal Vs USA, 1st Practice Match.